Seventy years after the Windsor Police hired its first black officer, few in uniform look like those they police. Seventy years after the Windsor Police hired its first black officer, few in uniform today look like those they police. Windsor is one of Canada’s most diverse cities. It is the fourth-most multicultural city in the country, according to Immigration Windsor-Essex. However, one black officer, Sr. Const. Mike Akpata, told CBC Windsor’s Tony Doucette on the Early Shift, the faces on the force don’t look much like those they meet on the street. "We’re trying to reach out, to ensure we’re representative of the community. The police department is doing its best to have people look like the people they’re policing. It will only make us better." Acting Windsor Police Chief Al Frederick assured the department is attempting to diversify its force. "We make concerted efforts to reach out to minorities and people of colour to attract them to our service. Diversity is a key to success. Diversity brings different perspective. It’s not just about skin colour or race or religion. It’s about diversity of education and experience," Frederick said. "We’re actively recruiting in all the diverse communities in Windsor. You have to get people interested and go to where they are." The service will hold recruitment meetings in the community, something it hasn’t done in the past, Frederick said. "Bring your kids forward. Let’s get them on the path to police as a career," Frederick asked of new Canadians and minorities. "It’s a process. It’s something we’re working on." Friday, the service celebrated Alton Parker, who broke the service’s colour barrier in 1942. Parker was also the first black detective in Canada. The city named a street after him Friday. "When they promoted him, they also took a risk. They could have said, ‘We’ve got him here. Let’s just keep him in the corner’ as opposed to moving him forward and putting in a position of authority," Akpata said. "I’m satisfied the Windsor Police Service started something in 1942, continued it in the 1950s when he was promoted and we’re working toward the day where questions about gender or race are not considered in policing." Cheryl McCurdy, who is black and teachers women’s studies at the University of Windsor, said the Windsor are slowly diversifying. "It’s absolutely important to me to see a diverse police department in Windsor. It’s always to have role models for your children to look up to. If your role models are not like them, it makes it difficult," she said. Akpata and Parker’s granddaughter, Diane Steele-Beer are both black police officers. Steele is a member of the Peel Regional Police. Both said race is still an issue. "Yes I still think that officers of colour and women officers of colour still deal with people that have less than complimentary opinions of people of colour," Steele-Beer said. "They try to break you down by calling you names based on race or gender. Grandpa told me that would happen. But you don’t lose your professionalism." Akpata said he is always on his best behaviour. "If I act in a manner that reinforces the stereotypical belief of a black police officer, I have done harm, not only myself, but to other members of the service," he said. "I cannot lower myself to their standard." 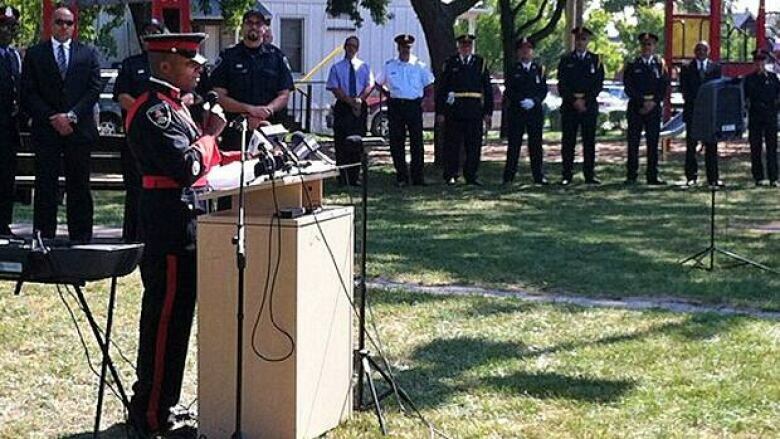 In June, Windsor Police learned Const. Kent Rice, who is white, was caught on security video allegedly kicking and punching a young, black man lying in a stairwell. There has never been an indication the incident was racially motivated. Still, after receiving the video, police notified members of the local black coalition. Coalition members watched the video and were told of how police are handling the matter. Rice has been suspended with pay and charged with assault. CBC Windsor asked the Windsor Police Service for a cultural breakdown of its members, but was told it’s "impossible" to provide one. New hires are not asked their race when they are hired.